What a touching image. Please tell us a little of the backstory. Elizabeth Fox has congestive heart failure, diabetes and arthritis and spends much of her time lying down because she gets short of breath very easily and her body aches. Eating, using the bathroom and talking tires her out quickly. About two years ago Elizabeth's doctor told Elizabeth and her family that she only had a few months to live. 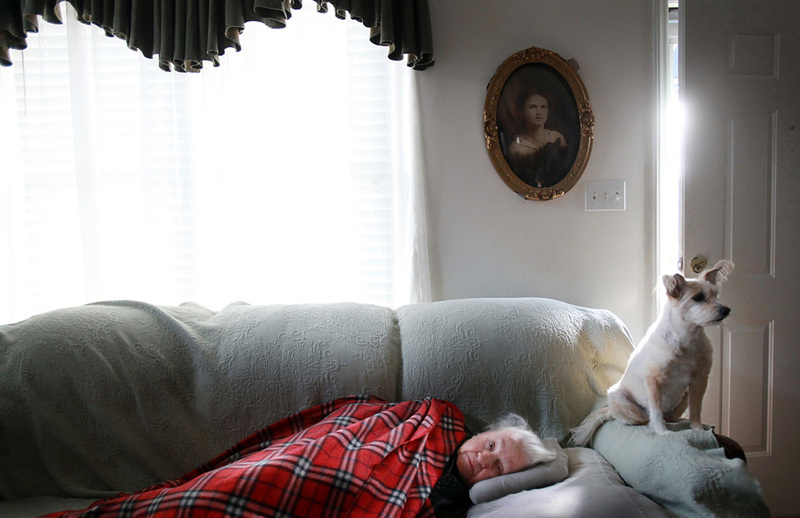 Elizabeth has always been pretty adamant about her refusal to live in an assisted living home so she lives at home with her dog, Tootles, an in-home caregiver, Danny, and a hospice nurse comes to visit her once a week. 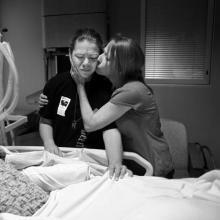 I met Elizabeth about a year ago when a reporter started working on a story about hospice care. The reporter brought me into the story about a month after she started working on it so I was spending a lot of my free time with Elizabeth since I wasn't sure when the story was going to run and honestly, how much longer Elizabeth was going to live. Since this is part of a story, can you tell us a little of the importance of where it fits in within the larger story? Elizabeth’s family lives nearby and they visit her often. When she’s feeling up to it, Danny takes her to the store or to visit family. However, most of the time Elizabeth doesn’t feel well enough to leave her couch and her days can be monotonous. At this point her family’s goal is to keep her as comfortable as possible and the medicine that she takes makes her sleep about 80 percent of the day. One day as Elizabeth and Danny sat down for dinner, Danny asked her if she wanted to say grace and as they bowed their heads she said, "Lord, if it's my time please take me. If it's not, please let me get better." That prayer really resonated with me. I knew from conversations with her and her family that Elizabeth was mentally ready for her own death but at the same time would set goals to live long enough to be with her family for different events like Christmas, someone’s birthday, a party. I had been struggling to show how Elizabeth feels day-to-day – photos that go beyond her routine and convey her strength and vulnerability. How did you build trust with her? Elizabeth and I really clicked from the very beginning so it was unbelievably easy to build trust. She’s a very warm and friendly person. It helps that I’ll sometimes spend hours with her and Danny just talking and not shoot a single frame. When I’m working on long-term stories, it’s important for me to establish a relationship without the camera in between me and the other person. It makes me listen, observe and engage in a different way. It gives me a better understanding of the other person and I think it helps the other person see me as more than just someone who comes over to take pictures. And honestly, I do it because I just love talking with people and learning more about them – it’s the reason I became a photographer. I also bring prints as often as I can. The reporter has decided not to publish the story until after Elizabeth dies so I really want to give her something that she can see and hold now. What challenges did you encounter while working to make this image, or within the project? The biggest challenge has been myself. At the beginning, I felt like I was just getting in my own way. I had these preconceived ideas of these emotional moments that I should be looking for, such as family members saying goodbye. But by the time I met her, Elizabeth had outlived her doctor's expected timeline by about nine months and she and her family had long since accepted that she would die. In fact, Elizabeth’s family had divvied up her belongings according to her wishes and cleaned out her refrigerator soon after the doctor’s diagnosis. I was also struggling a bit because Elizabeth's routine doesn't vary much. Like I said, Elizabeth spends much of her time on the couch or in her wheelchair at home. The times when Elizabeth feels up to leaving the house are very spontaneous and since I’m scheduling my visits around my daily assignments, I miss these moments more often than not. And it seemed that when I was spending an entire day with her, I couldn’t catch her on the days when she would have visitors or was feeling well enough to leave the house. So at the beginning I was afraid that what I was getting were photos of her routine: Elizabeth takes medicine, Danny feeds Elizabeth, Elizabeth sleeps. The photos I was shooting weren’t matching what I had in my head. Around this time I showed some of these images to a couple of friends and just talked through my frustrations. That gave me chance to take a step back and remember that Elizabeth’s story is her own. It’s hard not to come into a situation with preconceived notions of what moments we should be looking for when we’re surrounded by images every day and are shaped by our own experiences and feelings. However, we owe it to the people that we’re photographing to tell their story and not what we think it should be. Once I remembered that, it was easier to see the more subtle touches and moments in Elizabeth’s life. Now onto the moment. Can you talk about the time leading up to the picture and also the actual moment? 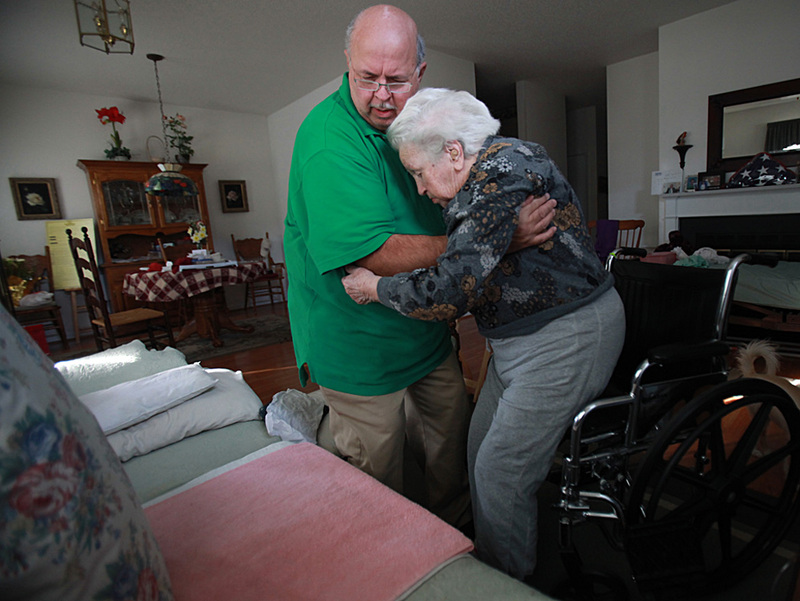 The moment happened after Danny helped Elizabeth back to the couch so she could nap after breakfast. I had come over early because I kept missing the hospice nurse’s visits because there’s not a set schedule. I knew one of the aides was coming over to wash Elizabeth’s hair and I was planning to give her my cell phone number to pass on to the nurse. Like I mentioned before, at this point I had photographed Elizabeth sleeping on the couch many times and didn’t really plan on photographing her sleeping on this visit. Danny had moved to the kitchen to get her medication ready and I was going to focus on him. 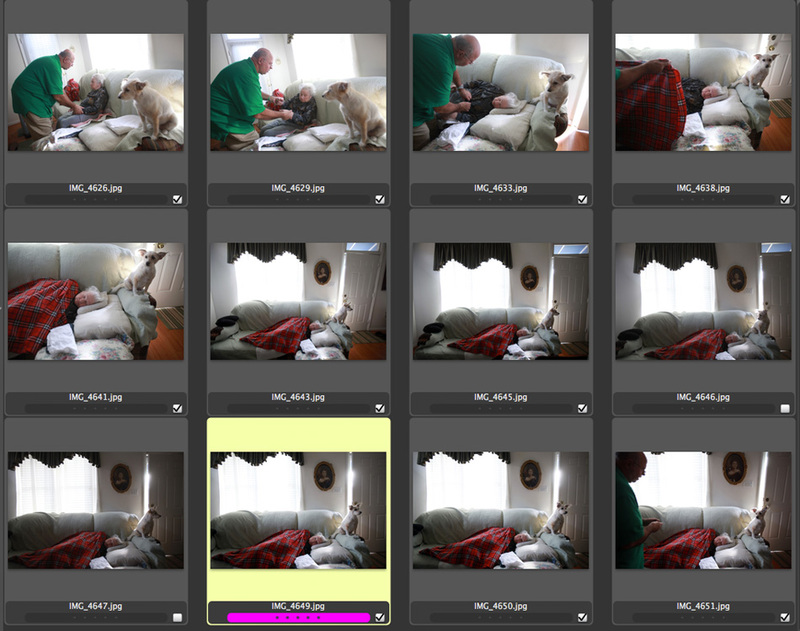 However, I couldn’t resist shooting a few frames because I really loved the way the light came in through the door, the way Tootles stood protectively over Elizabeth and the way the red blanket stood out against the couch. Most times she sleeps though the sound of the shutter clicking and other times she opens her eyes but isn’t really focusing on anything around her. There have been other times when she’ll see me and smile. I was actually moving the camera away from my face when she woke up and our eyes met. And when I clicked the shutter I didn’t move the camera back up to my face because I didn’t want to break the connection. I was surprised that I actually took the photo. Elizabeth’s body makes her physically vulnerable but she’s one of the most mentally strong women I know. The vulnerability in her eyes made me sad and our eye contact felt like an intimate moment just between the two of us. Elizabeth once told me that if people knew what she felt inside then they’d understand why she’s ready to go. So that’s why I pressed the button – I wanted others to understand too. To trust myself. Too often I go around second-guessing myself when a really personal moment happens – will this person be upset if I take this photo? Am I being respectful? And this can make me miss the moments that are meaningful and honest. If I’m asking someone to trust me with their story then I need to trust myself too. What have you learned about Elizabeth that people should know? Elizabeth is sweet and sarcastic and remembers everything. She knows what she wore on the first day of school when she was in first grade. 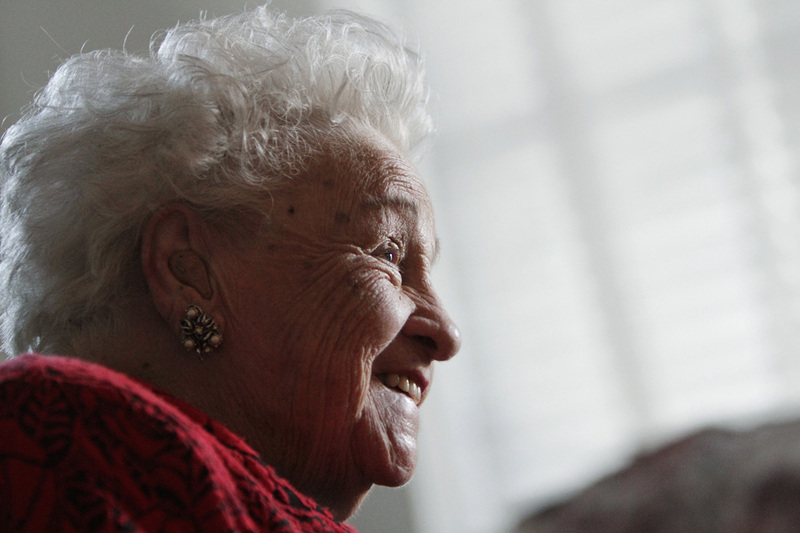 And up until she fell ill, Elizabeth was a very independent woman who took care of her husband when he had Alzheimer’s. Also, her arthritis makes it hard for her to use her hands so Danny has to help her eat. 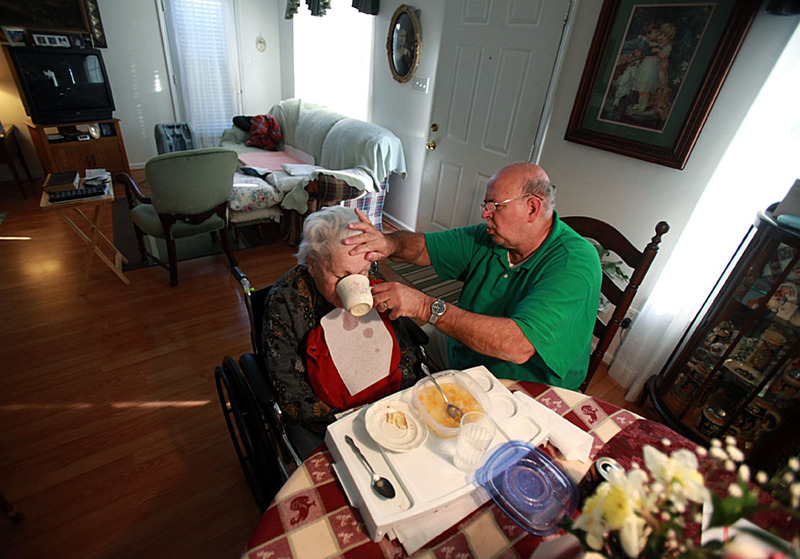 The first time I photographed Danny feeding her, Elizabeth looked at me and said, “People are going to think I’m lazy but I just can’t make my fingers move.” I told her that I would make sure that people would know that she’s not lazy. Be open to new things, be honest and respectful and have fun. Photography is awesome because it allows us to learn new things and get to know people that we’d never otherwise encounter. And whenever you start to feel discouraged, go out and take a picture that may not speak to anyone else but you, or go talk to someone and listen to their story. Basically, just remember what made you fall in love with photography, pursue that and you'll get over the hump. Christine T. Nguyen lives in Durham, N.C. and is a staff photographer at The (Durham) Herald-Sun. She graduated from UNC-Chapel Hill in 2001, where she studied visual communications and international studies. Currently she is searching for the perfect veggie burger recipe and ideas for her arm wrestling alter ego.